Blended Reality serves real food, blended. 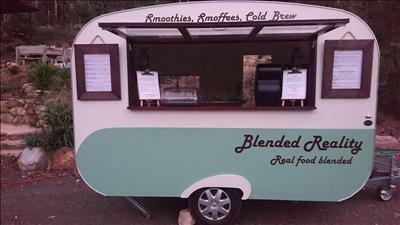 Smoothies, smoffees, Cold brew and Rawish Treats to festival beats. What is a Smoffee you ask? Smoothie + coffee = Smoffee. Combining your love of fruit smoothies with the kick of tasty cold brew coffee. Our smoothies can be a refreshing drink or you can step them up to a meal as a smoothie bowl. All of our food and drinks are vegan <3 That means it's dairy free but we also keep it gluten free and soy free. Most of our ingredients are organic so that you only get the bits you want, plants. We look forward to cooling you down and fueling you up. 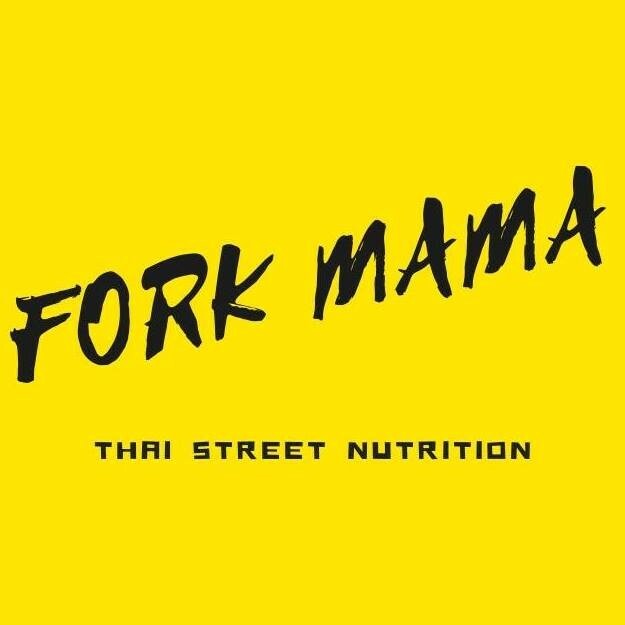 "FORK MAMA" serves up amazing Thai Street Food with a focus on super food. Fork Mama is a cruelty free, 100% plant based kitchen. Mama uses amazing faux meat products, working her magic to create incredibly tasty masterpieces that all can enjoy! Solid citizens of the highest order, Jerry's Vegiburgers contain advanced healing components and taste even better than they are healthy. 100% vegan and with gluten-free options we can satisfy a range of dietary requirement. 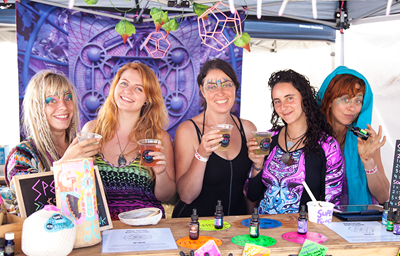 Magic Mixes make feel good Elixirs with freshly brewed probiotics, locally sourced organic fruits and our hand-made high quality herbal extracts that INCREASE energy, RELIEVE anxiety & BOOST immunity! Our passion is to awaken + empower people about the amazing benefits of herbal medicine used both recreationally & therapeutically! We embody an upbeat vibe, relax unwind have a good time!! It all begins with our food origins, rustic Greek fusion food from the heart. Serving up Greek yiro with a twist. We are Simon and Lila from Om Noms Burgers. 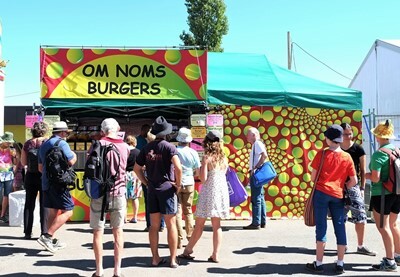 We have been trading as a pop up food stall for 6 years at music festivals, such as, The National Folk Festival, Subsonic Music Festival and Psyfari just to name a few. Lila is a qualified chef with over 20 years experience and Simon is a highly skilled and passionate cook, together we created Om Noms which shows just how much we love what we do. At Om Noms Burgers, we are very much customer focused and driven. Our customers feel valued not only at the front service counter but also with the food we create. We use high grade quality products and ingredients, some items are house made and others are sourced locally. We like to cater for all dietary requirements such as, gluten and dairy free and also vegan options and kids meals are available. We aim to have a broad price range so to assist with all customer budgets. We are conscious of our environment with only using bio degradable and recyclable packaging as well as environmentally friendly washing detergents. Vegan and Gluten free dishes. 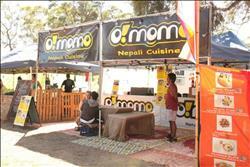 Delicious Nepali dishes from the Himalayas to the shores of Australia. Simple, nutritious and soulful menu to fill your belly and soul. 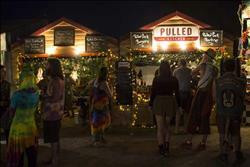 At Dragon Dreaming from day 1, Owens Oven has been creating excellent food freshly on site using our wood fired ovens and hawker style asian kitchen. Using fresh produce and a decor to match the excellent food, Owens (since 1995) has gained a reputation for excellent service, quality and value. We view ourselves as part of the festival community adding to the artistry and theatre of the production, whilst supporting many those behind the scenes. We specialize in delicious slow cooked pulled pork, pulled chicken and pulled jackfruit burgers, gluten free/vegan plates and poutine. Our pulled delights are served on a toasted semi brioche bun (or vegan bun on request) with zesty slaw with your choice of home made sauces: Coca Cola and coffee BBQ sauce, spicy mayo with kimchi, smoked paprika mayo or our vegan tahini miso sauce. Our poutine is made with hot chips, 2 cheeses, yeast gravy, fried shallots, spring onions, your choice of pork, chicken or jackfruit and a drizzle of home made bbq sauce. We also do amazing gluten free and vegan plates. A free self-serve array of hot sauces, condiments and jalapenos station is available so you can spice up your food as much as you like! Our food comes from love and so does our kitchen. 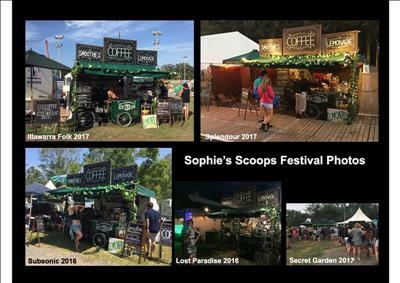 Feeding the people in festivals is our mission and we are proud to be a good value for money by serving generous portions that can be shared. We built our frontage out of timber and we look like a wood cabin. Our lounge decor is a magical forest scene with plants and warm fairy lights that creates a homely and welcoming space to enjoy your food and relax. We also bring a bookcase full of books and games for people to enjoy and provide art material so people can express themselves. We are passionate about giving good culinary experiences to people and serving tasty and beautiful meals is our way to spread love and happiness in festivals. Amazing coffee, expertly made, every time! 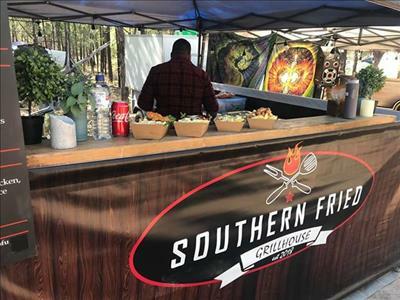 Southern Fried Grillhouse makes your tastebuds dance, with our homestyle grilled/southern fried chicken/tofu served with a side of salad and fries. Don’t forget to try our mouthwatering loaded fries and optional extra hemp seeds on your salads. All made from local ingredients and served on biodegradable packaging. Vegetarian, Vegan and Gluten Free Options available. Toasted Toasties are a nomadic food store, popping up right where you need us. We are glorifying the humble toastie, using only the finest ingredients, handled with love and dedication to create climax-inducing masterpieces. The team at 'Toasted Toasties' have an uncompromising approach to providing the highest quality food delivered alongside great vibes. Vegilicious aims to raise awareness about eating for health, sustainability & care for the planet by providing alternate choices in food & encouraging arts to raise social consciousness, acting as agents of change. 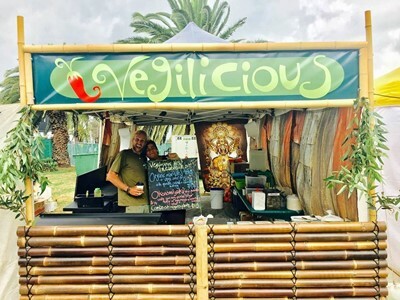 Vegilicious provides wholesome, organic, affordable vegan soul food, priding ourselves in serving super fresh food that is all homemade from scratch. All our produce is ethically sourced, considering locality, seasonality & environmental impact regarding packaging and waste. Food and Drink: Hot meals to warm things up starting at sausage sandwiches @$3, bacon-and-egg rolls, Kumara soup, omelettes, Moroccan chicken with roti and yes spicy eggplant pickle is back again! ; plenty of drinks and bags of ice for rehydration and cooling things down. Waffle-On: Light & fluffy Gaufres de Bruxelles and Gaufres de Liege waffles, your choice of topping favourites such as fresh fruit toppings, Belgium chocolate, maple syrup, and bacon. The Growing Beans: serving handmade fruit “smoothie bowls” with home-made granola and a variety of fruit and berry toppings that are sure to kick start your day or recharge your tanks. Art and Craft Stall: Local creators of unique products made from fox and feral cat skins; delicious home-made pickles; and other craft items including jewellery. To "allure" means to attract, fascinate, captivate or to be desirable and this is what I capture when creating my designs. I am a self-taught leather designer that creates unique and adjustable clothing as well as jewellery and fashion accessories. I use leather offcuts and where possible, I upcycle and recycle other materials to help reduce waste. Every piece has a story and not one piece is the same. My creations are typically tribal and post-apocalyptic themes with a touch of mystical magick, offering custom designs to Gods & Goddesses. They enhance your beauty from within. 'Allure Collection' is about getting in touch with your inner faery; encompassing leathercraft encrusted in jewels, stones and individuality. Organised Chaos Designs provides clothing and accessories inspired by world travel, adventure and passion. Catering for both men and women we create unique designs and styles, ranging from urban – boho – festival – alternative to everyday wear; always keeping in mind quality and originality. Prints include geometric, psychedelic and ethnic designs and current fabrics include hemp, cotton, lace, lycra, including the use of natural (chemical-free) dyes and recycled materials whenever possible (and growing – watch this space!). Accessories include naturally dyed cotton scarves, urban hats, handmade embroidered bags and wallets, pocket-belts and handmade jewellery, including silver and brass designs. Designs range from size 6 to 18 Australian, however there are some size restrictions depending on design. 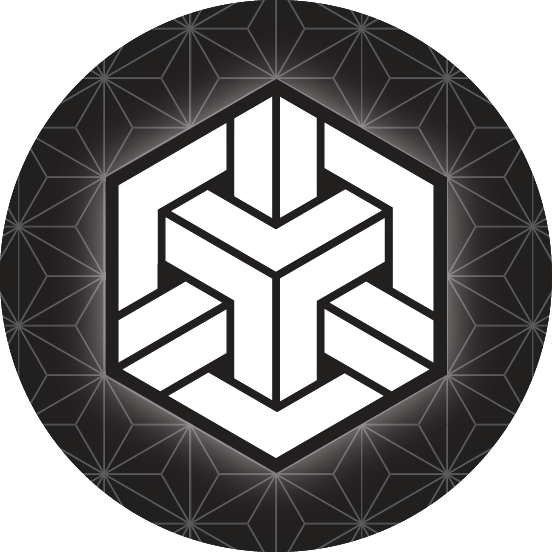 Cosmic Pretzel is a Clothing Label that draws influence from Sacred Geometry, Nature and the Universe. With a strong emphasis on geometry, colour and style. Cosmic Pretzel offers a diverse range of clothing products and accessories. Vibe High. Feel Fly. Fairy Floss is a unique alternative tribal clothing brand for women & men. Fairy Floss was established magically in 1998, in Byron Bay, the most easterly point of Australia. Choosing this location as one of the main inspiration for creativity, in this pristine magical nature spot on this planet, that is home for our very conscious open-minded tribe. As an underground fashion, our aim is to create unique, tribal and durable collections every season. As opposed to mainstream fashion, Fairy Floss and Pixie King is built to last, both in style and in quality. Fairy Floss is functional, comfortable, with lots of attention to details. Its simple and unique at the same time. The fabrics are mostly stretchy cottons that will flatter any form. We use leather, lace, frills, prints, studs, cuts and special washes. Fee Nix Creations is an ever evolving one stop shop for all your doof fashion needs, featuring 3 ranges designed to stand alone or to be melded togeher into your own unique style. The Psychedelic range includes super fun expressive pieces featuring bright colours and sparkling fabrics. Her influences come from festival culture, circus and more recently hip hop/street styling in creating glitter gangster apparel. The Urthen range earthy and structured. Heavily inspired by her life as a fire performer, and creating versatile pieces, this range is designed by Fee Nix and produced ethically in Bali, it features beautiful natural fabrics in more earthy tones. Most recently added to the collection is the Festish range A unique blend of festival and fetish wear, combining harnesses and sparkles to bring your festival game to the next level. The Fee Nix Creations shop will also feature a number of other local designers with one off creative pieces as well as all the accesories you could hope to find to finish off your perfect dance floor outfit. 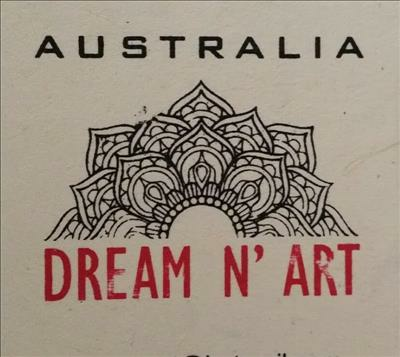 Om Art Gallery was founded by Sharad OM Jain in 2012 in Melbourne. Sharad had operated Om Art Gallery previously for many years In Rishikesh, India, specialising in handmade high quality jewellery. We offer quality handmade wearable accessories, shawls and stoles, handicrafts, bags and shoes in the traditional styles of India. All our products are either made by ourselves or sourced carefully by us in India with a strong emphasis on fair trade and a living wage for the craftsmen and women. 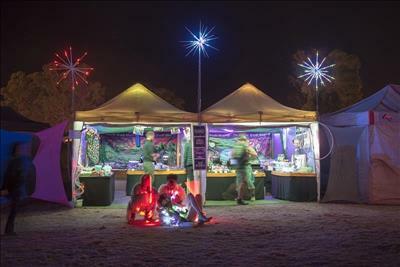 Periwinkle is a family-run festival boutique. Our unique tribal clothing, macramé jewellery and accessories are made with respect for Mother Earth and her children. Pipal Tree is an alternative store that supports handmade and traditional craft techniques. 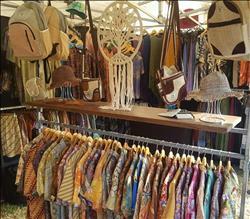 We have our own original collection of clothing and accessories produced in Indonesia and Nepal. Specializing in handcrafted shirts using the batik textile design process, and a long relationship developing alternative fashion and accessories in Nepal. Our stall holds all Eco friendly goods. Clothings are mostly cotton for summer wears and woollen and raw cotton clothings for winter. Our popular items are raw cotton Ponchos, Patched denim jackets with lining, Woollen coats and hand casted meditation bowls. As the name of our stall Stupa, our stall have collections from the Himalayan regions showing its purity and calmness through colours and simplicity ! We sell unisex clothing,accessories and hand made jewellery. Our products are hand picked from small family owned cottage industries in Nepal; they are made from sustainable natural fibres, are eco-friendly and follow and support fair-trade practices. Our products are brightly coloured and are mostly hand made-ideal for down to earth fun loving individuals. All of the products we stock are produced under our own Yak'nYeti label. 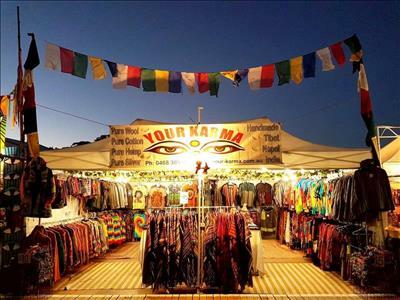 Yak Yak Yak is small import and retail business established in 2005. We ethically source our colourful, unique clothing, accessories and handicraft goods from Nepal. Most out products are environment friendly, it's made from natural fibre such as cotton, wool, hemp and recycle materials. We buy direct from manufacture, that way customer get great price on quality products. 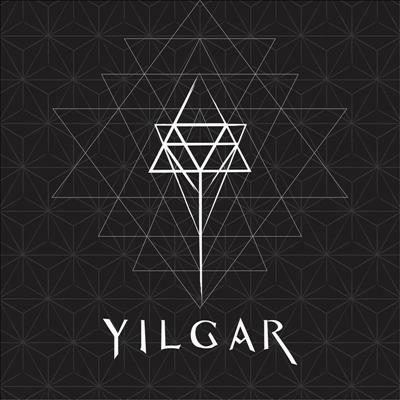 After extensive travels through the country side of India and Nepal, along the stunning himalayas, a vision was born and through it came Yilgar. 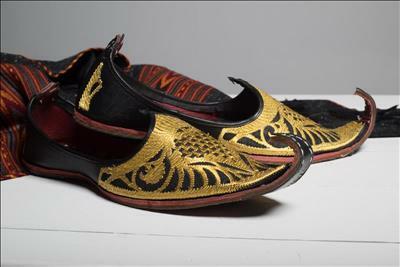 Inspired by the of colourful, exotic and beauty of their culture. The collection began with hand picked jewels and has extended to original clothing designs. Based in Sydney, Yilgar hand designs apparel, gathering inspiration from the festival scene around the world to bring a high quality and unique style. Returning twice a year we work closely to ensure everything is sourced and made ethically as well as using high quality fabrics and materials. We aim to bring fresh designs to Australia and create a platform to inspire the freedom of expression. Our stall is stunningly beautifully charging with colours and good energy, professionally displayed by using attractive paper flowers decorated to match the look and feel of our products. 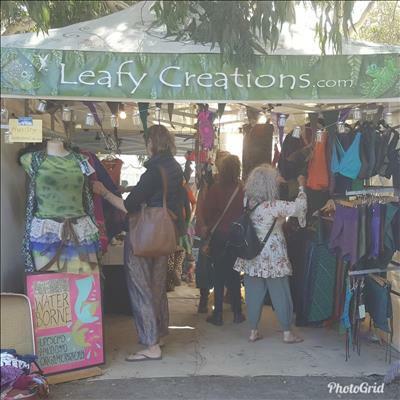 Earthy designs which reflect the nature of our products mostly made of organic materials such as hemp, cotton, and silk clothing (dress, shorts, cardigan, shirt, skirt, pants, top, shawl etc), ornaments, Sterling Silver jewellery and metal (copper / brass) collectibles such as metal sculptures. The products are unique as it is designed / handmade in Australia plus others outsourcing from Thailand, South America, Africa, India & Nepal. 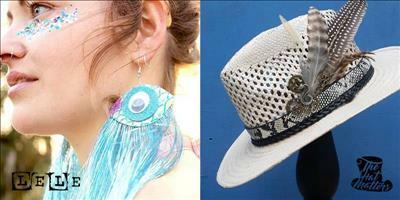 The Hat Matters is a Boutique Festival Hat Brand, all creations are hand made by Tennessee Charpentier. Customised hats available upon request. Each item is a uniquely crafted piece! I want people to feel special while wearing there hat who will become part of their identity. All hat creations are a myriad of vintage, upcycled & recycled bits and pieces part of my own jewellery collection or 2nd hands from family, friends, or what I m finding in op shop. Lele jewellery is a small independant company based in Melbourne. All pieces are designed and hand crafted by Leah Mcguire. Lele jewellery is all things sparkly, colourful and Magical. Inspired by psychedelic creatures of the universe and blooming botanical worlds. Lele is ready to kit you out for any upcoming Festivals, to be the king/queen of your next Party or to brighten up the world with everyday wear. 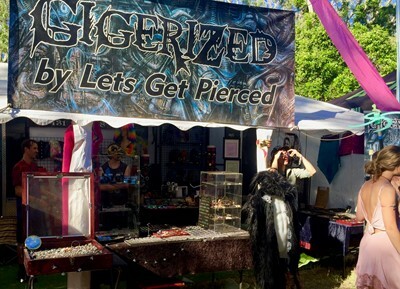 You will be sure to stand out with her range of unique and eye catching pieces." Lele Jewellery is a small independent company based in Melbourne. All pieces are designed and hand crafted by Leah Mcguire. 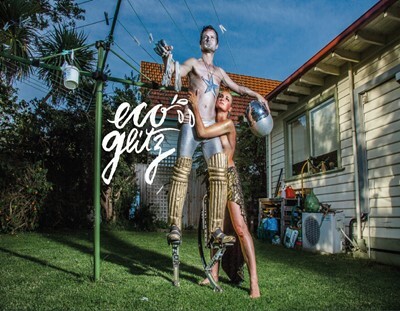 ECOglitz is the most environmental friendly glitter on the market. Unlike any other glitters, no composting is required and no waste lies on the ground! It's a plastic-free vegan glitter cream in over 20 vibrant colors: liquid gold, metallic blue, bedazzling crystals..
A product so pure and true, it doesn't even need to biodegrade! ECOglitz(TM) is handcrafted with certified organic plants, a food-grade preservative and shimmering mineral powders (mica) that can go to landfill, down a plughole or back to the earth and will not interfere with ecosystems. It is easy to apply to face, hair and body for a stunning glamorous festival look. Do it yourself or get one of our professional body painter to make you look stunning for a day and a night. When washed off with water, the cream dissolves and nothing is left but dust. No glitter bits on the ground and no plastic packaging. It's a 'Leave No Trace' product popular with festival goers and promoters. Apply thickly for a mirror-like surface, draw a clean strong sparkly line as precise as make-up or as a lighter coat for a thin shimmery feel. An eco-friendly, versatile best friend in your purse! 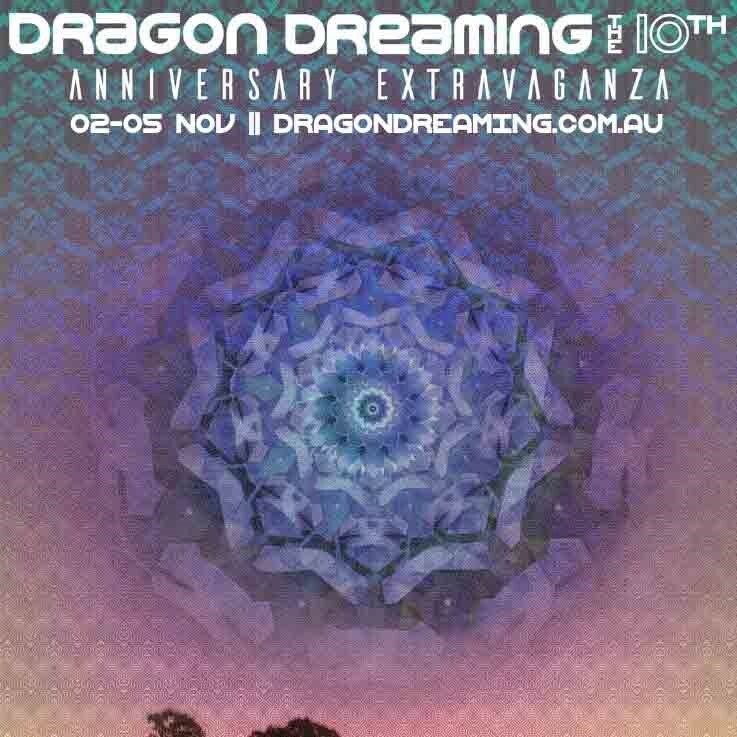 We've been searching the World for the best and brightest dance, performance, festival accessories, gadgets and gizmo's for nearly a decade now, and bringing them to you all over Australia so you can fly your freak flag high. Specialising in astonishingly bright U.V reactive, cosmetics such as face and body paints, crayons and eco glitter, with a huge range of special FX diffraction and kaleidoscopic eyewear , and the most amazing LED performance toys from all types of poi, space whips, LED hoops, space poi, ropes, gloves and orbits. 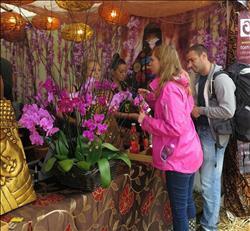 We have the best stuff, at the best prices, from the best companies, for the best festivallers . . . . in the World. 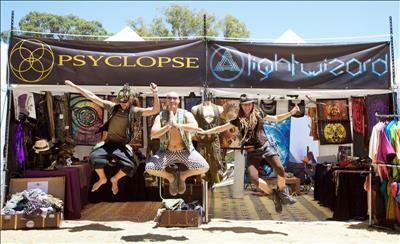 Psyclopse Clothing is a range of psychedelia steam punk skate clothing brand ethically made by men for men. With emphasis on durability without compromising on style, Psyclopse is designed to withstand festivals, trade work, performing arts and as everyday wear. Materials of the highest standards are carefully sourced to fulfil an intricate design process carried out in Australia. 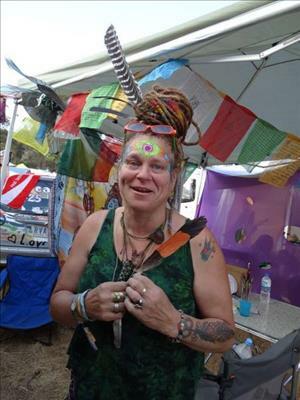 rainbow mama/Mabelles Dreams is a colourful and friendly stall! We specialise in dreadlocks, hair wrapping, feathers hair extensions jewlery, headbands and friendship bracelets. I make Clay, silver and bronze dreadlocks beads myself, inspired by Argentinian home and the ancient Inca deities we once worshipped? I am a dreadlock maintenance specialist and my full services are available on site. chilli sauces are often in display and sell from my wonderful senor chilli husband as its a part of our tradition. I have a “chill out space” where customers can feel safe and rest up from the dancing. I often run free dream catchers workshops. Hope to meet you there! Spiral Soul Seed is home to many handcrafted treasures. These are original design leatherbound crystals and adapted macrame techniques used to create wearable crystal companions. The pieces are all hand chosen and bound by me personally and range in style from small and simple, statement pieces, to rustic viking-esk designs. My jewelry is particularly accessible to men although it is unisex in nature :). 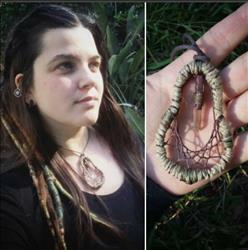 I also make dreamcatchers with wood, crystals, feathers and yarns to hang, or smaller pieces as dreamcatcher pendants. On site I offer custom hair wraps on site where you may choose your own colours and these are wrapped onto the hair (not clip in) with beads for these that can also be bought for dreadlocks. I can also bind crystals given to me on site.